VanHassel’s works create an evocative sound world drawing from a background in rock, Indonesian gamelan, free improvisation, and classical music. He has had works performed by ensembles such as the Talea Ensemble, Dinosaur Annex, and Transient Canvas, and been featured at the MATA Festival, Gaudeamus Festival, Bowling Green New Music Festival, and the International Computer Music Conference. 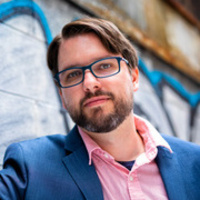 Dan was a founding member and artistic director of contemporary chamber ensemble Wild Rumpus through 2016 and is currently artistic director and guitarist for the Boston-based ensemble Hinge. Lecturer VanHassel teaches composition at MIT. Dan VanHassel will discuss the development of his musical language and the integration of compositional techniques from heavy metal, spectralism, hip-hop, and gamelan in his recent work. Please email ninadm [at] mit.edu to indicate any accessibility requirements.